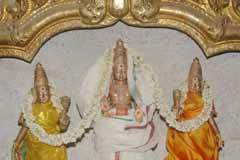 Saint Arunagiriar had sung the praise of the Lord of the temple in his Tirupugazh. Masi Brahmmotsavam in February-March, Vaikasi Visakam in May-June, Aadi float festival in July-August, Tirukarthikai in November-December and Thaipoosam in January-February are the festivals celebrated in the temple. 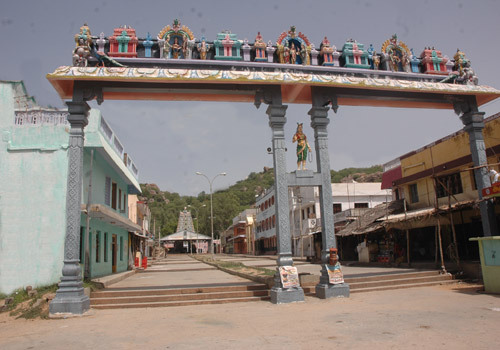 This is the place where Valli performed penance on Lord Vishnu to have the hands of Lord Muruga, hence the Sadari blessing with Lord Vishnu Pada (feet) is offered to devotees in the temple. 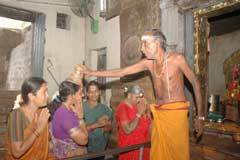 The temple is open from 7.30 a.m. to 12.30 p.m. and from 2.00 p.m. to 6.30 p.m.
Sri Subramaniaswami Temple, Vallimalai-632 520, Vellore district. +91- 4172 - 252 295. Devotees perform abishek, offer vastras to Lord Muruga and offer honey and Thinai corn flour as nivedhana. 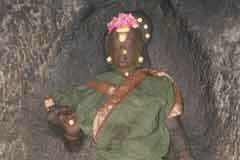 Generally float festival is celebrated in temple for a day only. 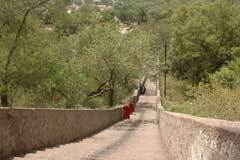 Here the festival is celebrated for four days going around the hill path. Women of the place, belonging to Valli’s community offer rice, jaggery, cereals, coconut, fruits and vastras as gift to Valli. Valli Kalyanam-Valli wedding is celebrated on the fourth day of the festival – Masi (February-March) poornima – full moon day. Lord Muruga-Deivanai wedding festival is celebrated the next day of Skanda Sashti in October-November followed by four day float festival. 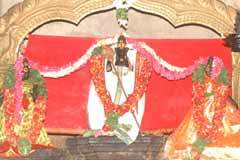 Lord Muruga visits the Saravana poigai that day. While generally Lord graces from under a Vimana - tower above the sanctum sanctorum-here the Gopuram is above the sanctum. Lord Vinayaka is in front of the flag post-Kodi Maram. 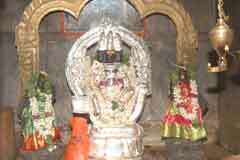 Nambirajan-father of Valli and the nine warriors (Nava Veeras) of Muruga are in the front mandap. The place from where Valli drove the birds to save the crops, the spring where she bathed, the mandap where she ground the turmeric for bathing and the place where Muruga appeared to have water for His thirst (Kumari theertham) are a little far away in a jungle like place. 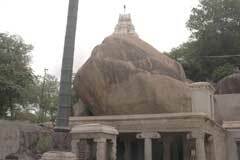 Lord Vinayaka who threatened Valli graces here in the form of a hill, called Elephant Hill. As these are interior places in a jungle, those who wish to see them should go with necessary protection. 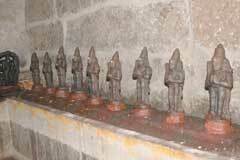 Lord Arumugha (Muruga with six faces) graces from a shrine in the foot hill. Tiruthani is 50 km far from this place. 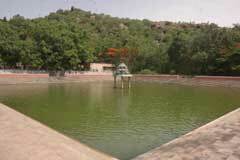 Vallimalai is 25 km from Vellore. All buses bound to Ponnai pass through Vallimalai. Also buses running via Sholingar pass through Vallimalai.